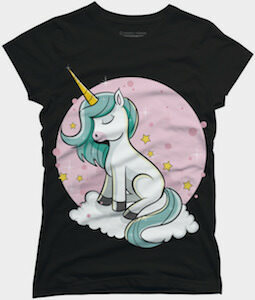 Now there is this Unicorn On A Cloud T-Shirt. 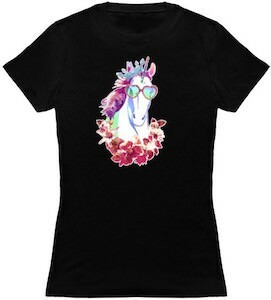 Men, women, boys or girls the whole family can have their own style of this amazing looking unicorn t-shirt. The t-shirt comes in many styles, colors, and sizes and on the shirt you can see a pink circle and I am wondering if it is a planet as there are stars on it too and then in front of it all you can see an amazing looking unicorn with wavy hair just sitting pretty on a white fluffy cloud. This is a great shirt and I am sure that kids will love wearing it but adults will look great in it too. 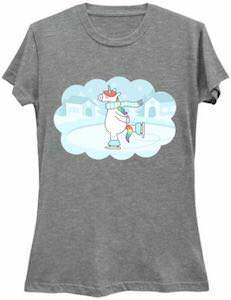 If you wonder what happens in winter then check out this Skating Unicorn T-Shirt. Yes, unicorns are real and this t-shirt proves it as it shows an unicorn enjoying ice skating white bing kept warm with a big long scarf. The whole winter scene looks like it is inside a cloud or maybe a dream. You can get this unicorn t-shirt in styles for men, women, and kids and it comes n many sizes going from small kids sizes to adult 6XL and it is available in many fun colors too. Show the world that you believe in the magical creature by wearing this t-shirt. 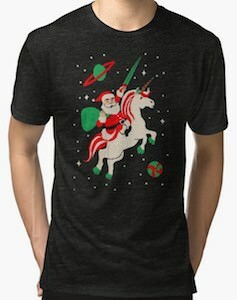 Now you know what is replacing reindeer as this t-shirt shows Santa on a unicorn. The t-shirt is available in a couple colors and in sizes Small – 2XL and it is an unisex t-shirt so that both men and women can wear this amazing Christmas t-shirt. On the t-shirt you can see outer space and there are green planets with red and then there is a bit white unicorn and on its back you can see Santa Claus and he brought a big green bag full of presents. The Christmas t-shirt is fun because it is different and that is one of the reasons why you really want this t-shirt. Now you can show the world that unicorns are real by simply wearing this t-shirt. 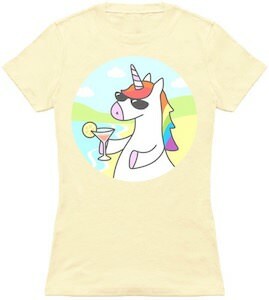 On the t-shirt, you can find a circle and in that circle, you can find a beach scene with a unicorn wearing some cool shades and holding a cocktail in its hand. So now you know why we never have seen a unicorn in this lifetime, it’s all because it’s just chilling on the beach somewhere that humans don’t go. You can get this amazing unicorn t-shirt in styles for both men and women and the t-shirt is available in many cool colors and in sizes Small – 6XL. Now you can show the world that you believe in unicorns as this tank top shows the world that they exist. This women’s tank top shows two clouds and in between the clouds you find a rainbow with two unicorns using it as a bridge so yes this is the prove that unicorns are real. 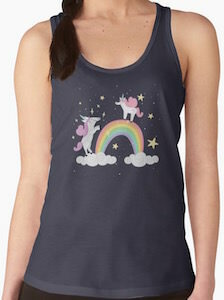 You can get this unicorn tank top in women’s sizes XSmall – Large and it is made from 100% cotton and no unicorn was harmed in the creation of this garment. Now you can have unicorns and a rainbow always handy if you just wear this fun looking tank top around town or to the gym. This t-shirt shows an image of a really sad unicorn and the unicorn is crying to. 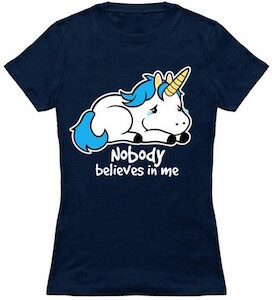 Below the image of the white unicorn with blue manes you can see the text “Nobody believes in me”. Of course it is a problem that nobody believes in unicorn’s but it does not help that nobody actually ever seen one. 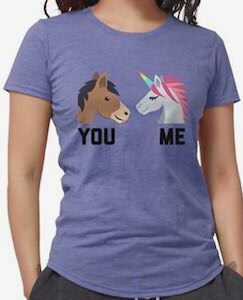 So maybe wear this t-shirt to show the world that unicorn’s are real. This sad unicorn t-shirt comes in many colors from dark sad colors to bright fun colors and the shirt is available in men and women’s styles in sizes ranging from Small all the way up to 6XL. This t-shirt is all about unicorns or at least that is what you want people to think. 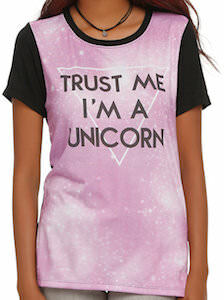 This women’s t-shirt is black on the back and has black sleeves but on the front it looks like a pink galaxy with a triangle on it and the text “Trust Me I’m A Unicorn”. As we never really seen unicorn’s how do we know how they would look like so maybe you are or become a unicorn when wearing this t-shirt. I doubt that you will get that horn on the front of your head but who knows if they where really part of a unicorn anyways. This women’s t-shirt comes in women’s junior sizes XSmall – 3XL for the perfect fit.